Photos above show a honeysuckle shrub I carefully sprayed while doing some other weed work. The second photo is about 20 days later. 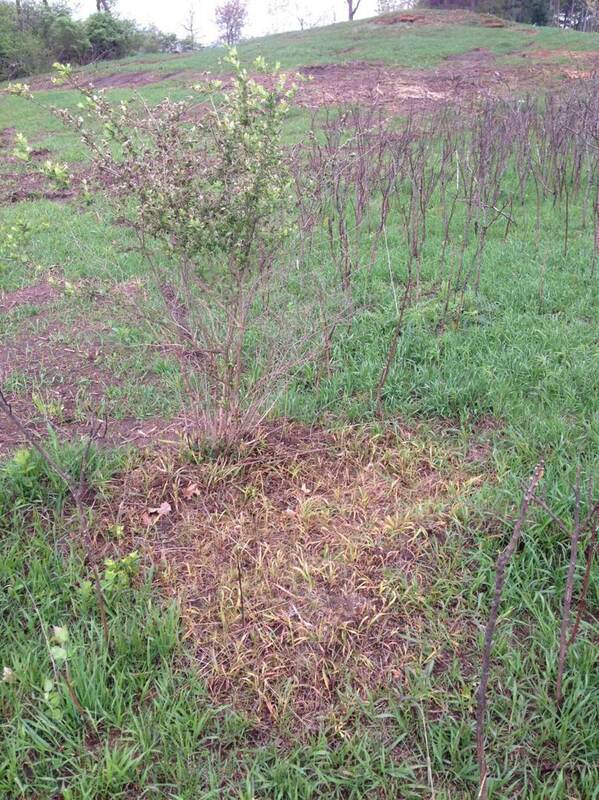 The shrub died but I show this photo to demonstrate the area of the off target damage. This would be the yellowing grass on what was the downwind side of this shrub. This area was ruderal-low diversity-junk so the damage does not matter in this case, but beware of spraying tall things like white sweet clover and shrubs where there are plants you do like nearby. 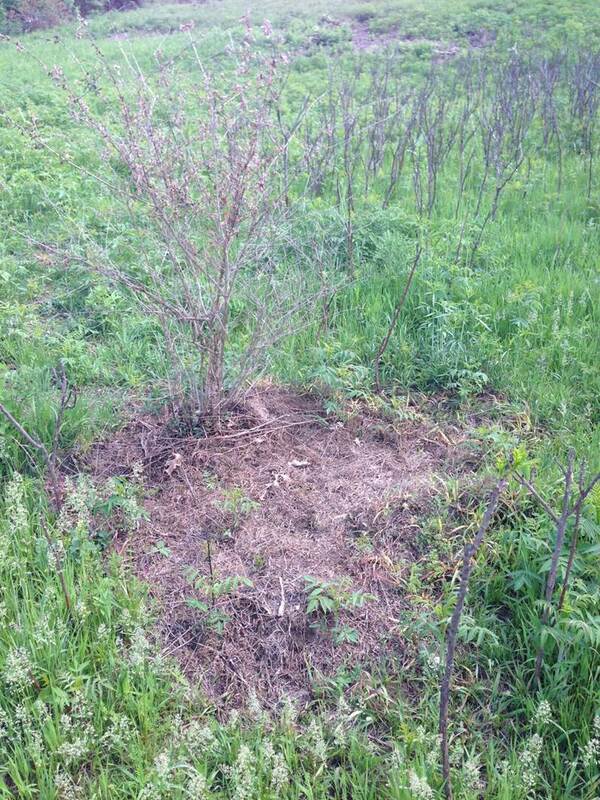 Choose a different method of control when the vegetation surrounding the target has native plants. This entry was posted in Uncategorized and tagged honeysuckle, invasive, overspray, shrub. Bookmark the permalink. Depends on the type of herbicide used and at what concentration which is not stated. And I did not foliar spray individual plants that were over above my waist and made sure it was not breezy when I if and when I did foliar treatment. What chemical did you use? It looks to me like glyphosate. Perhaps a different chemical choice would not have resulted in such a widespread overspray kill. I would argue that spraying in high quality sites is ideal. You may have some overspray onto native plants and kill them which never feels good, but the seed bank of good quality natives will fill in the kill area. It was glyphosate as I was spraying a monocot daylily nearby. My point is not which herbicide, but that the overspray occurs as the photo shows. This was not a windy day application. It was late in the day with little wind. If I had sprayed a broadleaf herbicide I would have had similar kill to the broadleaves, but the photo view would be less dramatic with the grasses all green. Where I work remnant habitats are very small and they sometimes have lots of brush trouble. If a person is working in a vast prairie then foliar spray away. I would not foliar spray tall plants in remnant habitats. The off target effect is too large. If this were a shrub on a prairie I could have applied Garlon 4 to the bark in cool weather with no rain coming. This might yield an impact area around the stem about six to ten inches, depending on how careful I was. Or I could cut and treat the stem and perhaps have very little effect to nearby vegetation. If this were a sweet clover I could use a spade shovel and loosen the soil next to it and give it a tug to get the root. Or cut it off late in flower. Thanks, Bill. A nice example of how we should be vigilant and careful with every management action. Sometimes it’s hard to predict or avoid unintended outcomes, but in this case, now we know. Wow. Scary stuff. Really good post. Just curious, at the time you were spraying did you think, “Im really getting this stuff all over the place” or was it like there was a mist or drift (overspray) that was spreading that you just weren’t noticing? I had some glyphosate mixed with Habitat herbicide in my pack for something else I was spraying, so I sprayed one shrub to see what it would do. Killed plant well. I was not surprised to see the kill zone. I could see the mist. If I was spraying some broadleaf herbicide like Garlon3A I would not have had the photo with all the brown grass, but the non-target effect to forbs would still be there. Just a word of caution about foliar spraying shrubs.